Some students come to a SARCRAFT course once. They get what they need on one specific topic and then they move on. Most students come to SARCRAFT over and over, and through time, we get to know about them, their families, their careers, and their training goals with us and how we can meet them. We know their favorite seat under the pavilion, which campfire meal they like best, and just what we can do to make their experience special. And then there are the others. The students who go deeper, and become invested in our success like it’s their own. Who are not only here every time the doors are open, but come up on off days and after hours to help us build, grow, and expand. This last group is personified by Robert Gore. Since he met us, he’s been to every course he could, but beyond that, he’s been a tremendous help in most of the infrastructure you see at the Proving Ground. He played a major role in raising about a third of the pavilion trusses, and helped put most of the roof on. His willing help and great attitude couldn’t have come at a better time. He is a wealth of entertaining Army stories, timely comments, and helpful insight. 1. What do you do for a living? I work for a tech company doing Information technology, installation and security work. 2. What are your favorite things to do in the outdoors? Sitting around a campfire at night with good friends and better alcohol. 3. How did you learn about SARCRAFT? JJ and I both have scouts in the same Troop. When I found there were people crazier than me, I had to go hang out with them. 4. What was your favorite memory with us? That is hard to answer.. we always find some way to have a good time in class and hanging out. But if I had to choose only one, it’d be from First Aid for the Outdoor Enthusiast, my first course at SARCRAFT. It would be carrying Alex out of the woods and the look of surprise on JJ’s face when we actually picked him up to carry him out of the woods on the makeshift litter… yeah, he wanted down quickly. 5. How has training with SARCRAFT helped you in the field? A lot. Not necessary in one area... As I’ve said in the past, I actually have knowledge of many of these skills from growing up with my grandfather… kicking the dust off and practicing them, plus the additional tips and tricks I learn at class definitely helps me bring those skills back and improve on all of them. Just great to get out in the woods and hang with others who enjoy getting out there. 6. What skills and topics do you look forward to learning with us in the future? Tracking and stalking, since I messed up my leg right before the last class which I was really looking forward to. Other than that, just being a student. Learning from the instructors and fellow students. Enjoying my decompression time in the woods with friends old and new. Robert has gone from student to friend to family, and is about to step into his next role with SARCRAFT… Instructor. Robert is a highly talented leatherworker, and has created some true works of art in leather. (Our favorite might be the whiskey bottle hip holster.) 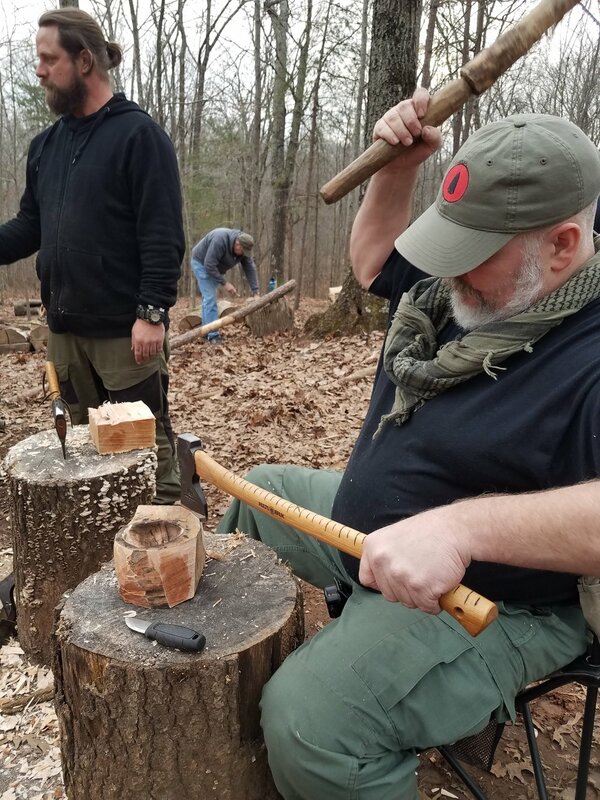 If you’d like to hang out with him and get the chance to learn from his expertise, join us for Sunday Afternoon Bushcraft: Leatherworking on Sunday, February 10th from 2pm-7pm! Register now at https://www.sarcraft.com/course-registration/register-sunday-afternoon-bushcraft!